Wow! Christmas is coming! And PM is ready with a Big Christmas Special Edition. Something a little different but just as colorful, vintage and set and Marx filled as ever! PM 90 has gone to press with an expected shipping date of October 25th, right on schedule as have been all previous issue back 15 years to 2001. 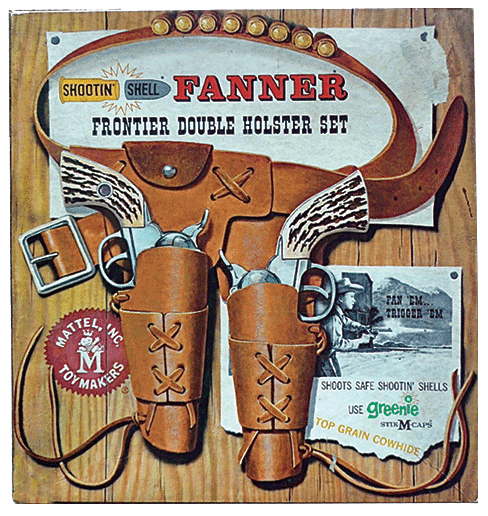 For the first time we have a rootin' tootin' shell-shootin foray into the gun that won the West -- the West Coat kids of the late Fifties, that is: all of us battled it out with Mattel's Shooting Shell rifles and Fanner pistols, often rigged up in big boxed sets, and sometimes as individual six shooters or rifles. You'll know the full story, and see all the sets in a big, beautiful article poppin' shots into that cowboy or cowgirl heart. And we're right proud of this issue, with a super secret Marx story that we've not covered before in any detail- the fabled, and very interesting A&B tables. This is good, colorful reading. We also have the Marx Army Mobile set, sort of a precursor to the Marx Training Center sets. As well as the Marx Army Assault blister carded set, and a look at one aspect of the Lone Star Robin Hood sets. These are the kind of sets that other makers offered with Merry Men and Knights and accessories, a great follow-up to last issues 60mm Robin Hoods. We are thrilled to report that Ron Barzso has released a beautiful new item for Christmas, a towering an majestic Medieval Castle Tower that fits right into that last issues theme, and the coming 54mm Robin Hood sets in Marx Castles Part III. This is Ron's truly spectacular offering and we have details and photos. Vietnam comes alive in Nick and DeAnna from TSSD's new line, and the figures are terrific, with lots of detailing. Wait till you see the new Viet Cong -- Many are saying its about time we get this deadly enemy in miniature, and these are great sculpts with a dynamic animation and ferocity; really great sculpting all the way around plus a jungles worth of new accessories. You'll be wanting to know what happens when Police Patrol, a very colorful boxed set from the very origins of retro toy making, this vintage set is a whopper for color. Then there's the big OTSN Chicago Toy Soldier Show report, and we deliver prices and "what sold" news with all the inside stories and tons of color photos. Plus news, lots of pages of ads for the vintage sets, figures and accessories you need, plus news and a new My Side by Kathy and a new Marx Memory. Oh, boy! 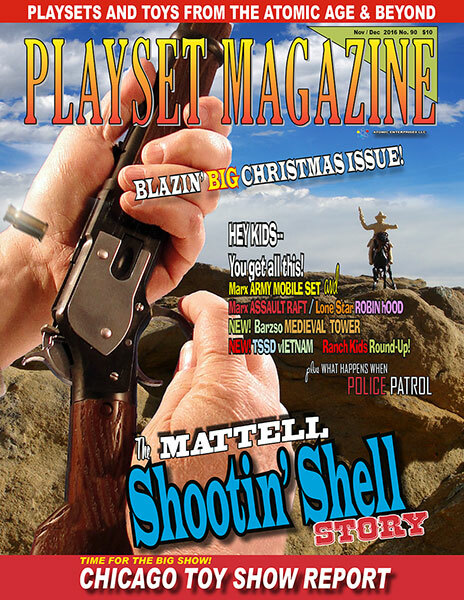 It's all here this issue in Playset Magazine and we're so glad and proud to have you with us. Thanks for being right here as our first issue 90 hits the mails right on time for your festive holiday reading and entertainment. Thanksgiving everyone! God Bless us all and Elect the right President!